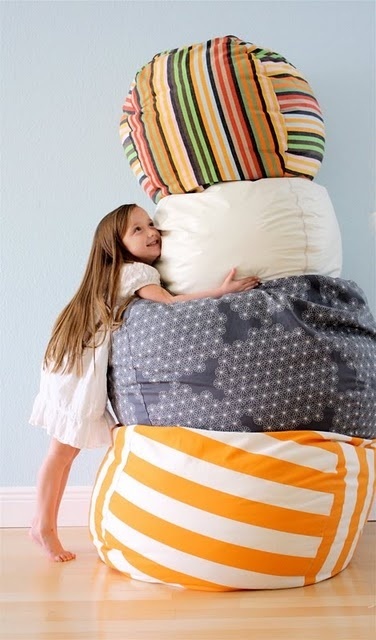 When my Mom and I spotted these Bean Bags on Pinterest, we thought they'd be pretty special for the kids. So my lovely Mom jumped right on the idea and now my kids have TWO! Here they are stacked like in the photo above. She made two of the larger ones. She first made an insert out of fabric that I filled with stuffing and then hand sewed the seam together. Then I inserted the whole thing into the outer slip cover. For the stuffing in the blue one, I used Fiberfill. The gray and white one was stuffed with bean bag filling. I'm going to see which one holds up over time. They each feel different. The bean bag stuffing seems to be firmer and give more of a chair feeling and the fiberfill feels more like a big pillow. Boxes are just as fun, so if you don't want to try making a bean bag, just get your kids a box. But I like the look of the bean bag chair myself. This fabic is called Amy Butler Home Décor Lark Ivy Bloom Lake. The fabric on the right is called my Amy Butler Home Décor Lark River Shine Cinder. Both fabrics are from fabric.com. Thank you Mom! The kids love the bean bags!